Sometimes the best way to try a new technique is just to make one block, rather than an entire quilt's worth. That's the thought process behind Wendy Sheppard's "Solar Star" table runner in the new book Dazzling Diamond Quilts from Annie's Crafts. Wendy designed this runner using a combination of warm and cool colors from Contempo's Palm Springs collection. How would you describe the style of this project? Hmmm. I would describe the style of this project as modern without sacrificing on tradition and technique - modern because of the fabric choice, traditional because of the feather star block. Can you talk about how you made your fabric choices? To me, picking colors for my designs is not always scientific as far as being predictable. I look for contrast in my quilt colors. I thought inserting the black in the block center would first really draw the eye to the block center and pique one's interest to want to look at the rest of the block and quilt. And then, the attention will start to move from the center to the rest of the block (hopefully!). So, instead of a blend of warm colors, I played with the idea of using a cool color to give a bit of unexpected element to the block. I carry that idea of to the borders as well with the green borders. Why did you choose to use just one block? This is sort of a one block wonder project. 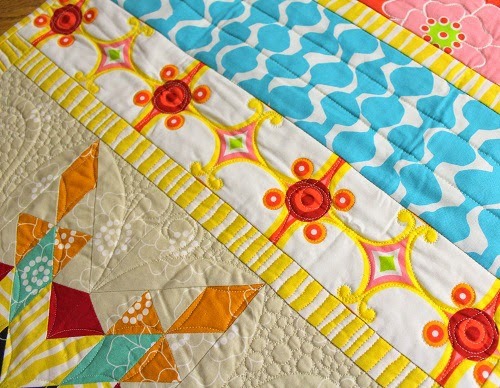 So often, quilters don't feel like attempting a huge quilt to try out a new technique. 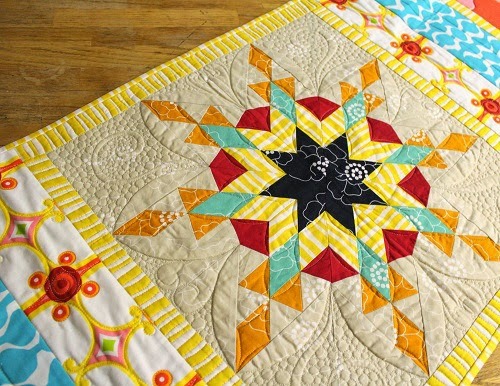 I used this runner project to introduce the idea of template piecing in a feather star. Someone making this block will find it easy to finish up the project because she would only have to make the block once and not 25 times in order to finish up a project. Any tips you'd like to share for diamond piecing? I find that pinning is essential (I have written about it here and here). I always tell quilters to just jump in and try out a new technique. One never knows unless one tries. 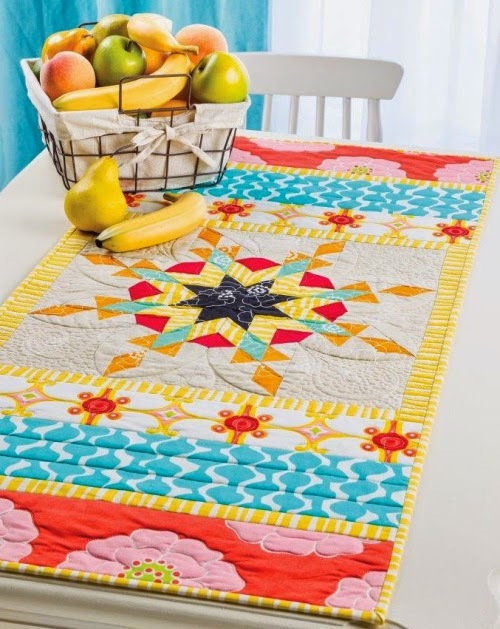 The Dazzling Diamond Quilts book is a great primer for those who want to try out diamond piecing for various projects - it was a great honor to have Solar Star featured in it. To read more about Wendy's table runner (plus additional close-up photos!) 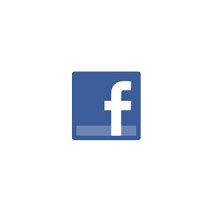 and see her other work, click here. To see the entire Palm Springs collection from Contempo, click here. 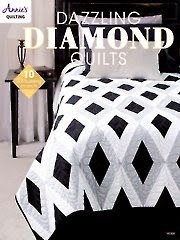 To find out more about the Dazzling Diamond Quilts book, click here.